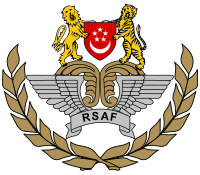 The Republic of Singapore Air Force (RSAF) is the air arm of the Singapore Armed Forces. It was first established in 1968 as the Singapore Air Defence Command (SADC). In 1975, it was renamed the Republic of Singapore Air Force. Former Singaporean air force ensign, used from 1968 to 1973. Former Singaporean air force ensign, used from 1973 to 1990. The predecessor to the RSAF, the SADC, was formed in September 1968. The SADC's immediate task was to set up the Flying Training School to train pilots. Qualified flying instructors were obtained through Airwork Services Limited, a UK-based company specialising in defence services. Basic training for pilots was carried out using two Cessna light aircraft hired from the Singapore Flying Club. The SADC also enlisted the help of the Royal Air Force which introduced the first flying training syllabus and provided two ex-RAF pilots as instructors, as well as facilities and services at Seletar Airport. Finally, the first batch of six pilot trainees were sent to the United Kingdom in August 1968 to undergo training in various technical disciplines. The training was based on the Hawker Hunter, the SADC's first air defence fighter. The following month, another pioneer group of technicians, this time from the rotary wing, were sent to France to begin their technical training on the Aérospatiale Alouette III helicopter. In 1969, a number of local RAF technicians were released to join the fledgling SADC. These local technicians (local other ranks) had experience working on fixed-wing RAF aircraft such as the Hawker Hunter, Gloster Javelin, English Electric Canberra, English Electric Lightning and Avro Shackleton; as well as rotary-wing RAF aircraft such as the Bristol Belvedere, Westland Wessex and Westland Whirlwind. Eight Cessna 172K aircraft – the SADC's first – arrived in May 1969 to be used for basic pilot training. By December, the first batch of students completed the course. Of these, six were sent to the UK to receive further training. On their return to Singapore in 1970, they were ready to operate the then newly acquired Hawker Hunter fighter aircraft. The pace of training pilots and ground crew picked up gradually. On 1 August 1969, Minister for the Interior and Defence, Lim Kim San, inaugurated the Flying Training School (FTS) at Tengah Air Base (then known as RAF Tengah). The inauguration of FTS brought SADC closer to its goal of fulfilling the heavy responsibility of defending Singapore's airspace. The subsequent arrival of the BAC Strikemasters in 1969, used for advanced phase flying training, meant that pilot trainees were now able to earn their initial wings locally rather than overseas. The first batch of locally trained fighter pilots were trained at the FTS and graduated in November 1970. Amongst this batch was 2LT Goh Yong Siang, who later rose to the appointment of Chief of Air Force on 1 July 1995. Gradually, the SADC had its own pilots, flying instructors, air traffic controllers, and ground crew. When Britain brought forward its plan to withdraw its forces by September 1971, the SADC was suddenly entrusted with a huge responsibility and resources. Britain's former air bases – Tengah, Seletar, Sembawang and Changi – were handed over to the SADC, as well as its air defence radar station and Bloodhound II surface-to-air missiles. In 1973, the SADC procured Shorts Skyvan search-and-locate aircraft and Douglas A-4 Skyhawk fighter-bombers. With a reliable mix of fighters, fighter-bombers, helicopters and transport aircraft, the SADC was ready to assume the functions of a full-fledged air force. On 1 April 1975, the SADC was renamed the Republic of Singapore Air Force (RSAF). One of its first commanders was LTC Ee Tean Chye. The RSAF celebrated its 50th Anniversary in 2018 with the theme "Our Home, Above All". 50 years of RSAF history can be accessed here. The RSAF celebrated its Golden Jubilee with an extended flypast during the national day parade on 9th August and also performed 2 sessions of aerial display at the Marina Barrage on the 11th and 12th of August. RSAF history factsheet can be accessed here. 2004-2008: Multi-National Force – Iraq. Aircraft participated in the Iraq War and returned home after two or three months deployment in the Persian Gulf without any ground troops involved. Singapore's withdrawal was acknowledged on 23 December 2008. The RSAF is led by the Chief of the Air Force (CAF) and Air Force Command Chief. The Air Staff comprises six functional departments: Air Manpower, Air Intelligence, Air Operations, Air Engineering and Logistics, Air Plans and Air Training. There are also two specialist departments: the Air Force Inspectorate (AFI) and the Office of the Chief Air Force Medical Officer (CAMO). The current CAF is Brigadier General Kelvin Khong Boon Leong. On 5 January 2007, Defence minister Teo Chee Hean announced that the Air Force organisation chart will be re-structured into five major commands, namely the Air Defence and Operations Command (ADOC), the Air Combat Command (ACC), the Participation Command (PC), the Air Power Generation Command (APGC) and the Unmanned Aerial Vehicle (UAV) Command (UC). The first to be inaugurated was ADOC, along the restructuring announcement. ADOC is the principal agency in charge of planning and executing peacetime operations and air defence. ADOC is also responsible for the development and operational readiness of the command and control and ground-based air defence units of the RSAF. UC was the second command to be inaugurated and become operational in May 2007. The next command to be inaugurated was PC in January 2008. The last two commands, ACC and APGC, were inaugurated together in August 2008 in conjunction with the RSAF 40th Anniversary. The ACC will bring together fighter and transport squadrons under one command, with central planning, control and execution of the air battle in operations. The APGC will enhance the missions of the ACC by ensuring that all air bases remain operational at all times, as well as improving the servicing and turn-around of aircraft to ensure continuous and responsive operations. The four support squadrons still remain organic to each Base but are under direct command of APGC. These four squadrons are: Airfield Maintenance Squadron (AMS), Ground Logistics Squadron (GLS), Field Defence Squadron (FDS) and Flying Support Squadron (FSS). The Air Force Training Command (AFTC) is an amalgamation of the former Air Force School, Flying Training School and UAV Training school which facilitates training of future pilots and ground crew of the RSAF. An F-5S of 144 Sqn preparing for take-off. An F-16C of 140 Sqn. Demonstration of a M-113A2 Ultra Mechanised Igla IFU on deployment, visible in the background is an I-HAWK SAM launcher. Exercise Forging Sabre 2009, an RSAF's IAI Searcher II UAV parked inside the hangar of Henry Post Army Airfield, United States. RSAF Black Knights – RSAF's aerobatic team. The backbone of the RSAF is formed by the Block 52/52+ F-16 Fighting Falcons. These are armed with US-supplied AIM-120C AMRAAM missiles and LANTIRN targeting pods, laser guided munitions and conformal fuel tanks for long-range strike. While Singapore initially bought as many as 70 F-16 planes, on 18 November 2004, it was announced that the RSAF would offer its remaining 7 F-16A/Bs to the Royal Thai Air Force. It is believed that these early Block 15OCU aircraft were upgraded to "Falcon One" standard by ST Aerospace before the transfer and delivered in late 2005. In return, the RSAF was permitted to train at the Udon Royal Thai Air Force Base in north-east Thailand for a specified number of days each year. This would mean that the RSAF will operate only the Block 52/52+ model, as many as 62 F-16CJ/DJ planes. Due to severe airspace constraints within Singapore, the RSAF operates its aircraft at several overseas locations to provide greater exposure to its pilots. With the F-16C/D Fighting Falcons, KC-135R Stratotankers, AH-64D Apaches and CH-47SD Chinook helicopters based in the United States, the Marchetti S-211s, PC-21s, and Super Puma helicopters in Australia, and the TA-4SU Super Skyhawks in France, almost one third of the force's inventory is based outside Singapore. In 1994, the RSAF commenced a modernisation program for its fleet of approximately 49 operational (R)F-5E and F-5F aircraft. The upgrade was performed by Singapore Technologies Aerospace (STAero) and the upgraded aircraft were designated (R)F-5S and F-5T respectively, operating from Paya Lebar Air Base. These upgraded F-5S/T, equipped with the Galileo Avionica's FIAR Grifo-F X-band Radar are thought to be capable of firing the AIM-120 AMRAAM missile but to date, no actual live-firing has actually been reported. For in-flight refuelling, four KC-135Rs and four KC-130Bs are commissioned to support the fighter force of F-16C/Ds and (R)F-5S/Ts. Airborne Early Warning and Control (AEW&C) capability was introduced in 1987 when four E-2C Hawkeyes were delivered to 111 Squadron. The duty of Maritime Patrol and Coastal surveillance is performed by the five Fokker 50 MPA (entered service in 1991) of 121 Squadron, which can be armed with long-range anti-shipping AGM-84 Harpoon missiles and ASW torpedoes. As part of its fleet renewal process, the RSAF officially withdrew its fleet of ST Aerospace A-4SU Super Skyhawk from front-line service on 31 March 2005 after 31 years of operations. The A-4SUs' achievements included flying directly from Singapore to the Philippines, incorporating the RSAF's first air-to-air refuelling mission in 1986, as well as the excellent aerobatic display of the 'red and white' Super Skyhawks flown by the RSAF Black Knights during Asian Aerospace 1990. A month before its retirement, the Skyhawk squadron won top honours in a strike exercise against its more modern F-16 and F-5 counterparts. Singapore ordered a total of twenty AH-64D Apache Longbow attack helicopters in two batches. After a long period of negotiations over the delivery of the sophisticated Longbow Fire-control radar, the first batch of eight aircraft, fitted with the Fire Control Radar, was delivered on 17 May 2002. The second batch of 12 Apaches were ordered in 2001 even before the first delivery took place. All of the initial eight Apaches are based in the United States. Three of the Apache Longbows returned in January 2006 at the request of the Minister of Defence. Apart from the six CH-47SDs delivered from 1996, a new batch of six aircraft was ordered in 1997, with an option of four extra airframes. At least 12 CH-47SD have been delivered and are in service at Sembawang Air Base. It is believed that these had been upgraded to the SD standard prior to delivery. Eight CH-47SDs were also deployed to support the relief efforts in the aftermath of the 2004 Indian Ocean earthquake and tsunami. It was the first and one of the few countries to reach the affected areas. The RSAF deployed dozens of C-130Hs, CH-47SDs and AS 332Ms there along with three of the RSN's latest Landing Ship Tanks (RSS Endurance, RSS Persistence and RSS Endeavour of the Endurance class LST) as well as Singapore Armed Forces vehicles, engineers, and medical teams. In September 2005, the RSAF sent three CH-47SD Chinook helicopters, later augmented by a fourth CH-47SD Chinook, to provide assistance in the rescue and evacuation of stranded civilians after Hurricane Katrina struck New Orleans and nearby areas in the United States. The humanitarian effort by Singapore involved more aircraft than any other foreign countries. Since 2003, the RSAF has also made deployments of KC-135 tankers and C-130 aircraft to the Persian Gulf in support of the multinational efforts for the reconstruction of Iraq. RSAF personnel have carried out airlift, transportation and supply, and air-to-air refuelling missions in support of the multinational forces, assisting the Coalition in carrying supplies and personnel, transporting humanitarian material and conducting medical evacuation operations. In September 2013, Defence Minister Ng Eng Hen stated in a parliamentary reply that Singapore would soon acquire the Aster 30 land-based missile system. RSAF day is celebrated on the 1st of September annually, in 2018 a combined flypast including the new A330 MRTT with a special 50th anniversary livery took place at Tengah Air Base. Military ranks in the Singapore Armed Forces are identical across the three services except for the flag ranks of the RSN. They are based on the Army model. The official table of ranks stops at three stars for all three services. NATO rank codes are not officially used, but are listed here for easy comparison with other armed forces. Like the Navy, the majority of Air Force personnel are regulars. This is due to the specialised and technical nature of many jobs. The employment of National Servicemen in various roles are limited mostly to the infantry-like Field Defence Squadrons which do not require such specialised training. The F-15SG Strike Eagle is a variant of the F-15E Strike Eagle and is similar in configuration to the F-15K sold to South Korea, but differs in the addition of the APG-63(V)3 active electronically scanned array (AESA) radar developed by Raytheon. The F-15SG is powered by two General Electric F110-GE-129 29,400 lbf (131 kN) thrust engines. In February 2003, Singapore joined the JSF program's System Design and Development (SDD) Phase, as a Security Co-operation Participant (SCP). The first deliveries of the F-35 are not expected before 2015, but replacement for some of the ST Aerospace A-4SU Super Skyhawks was needed by 2007. As a start, 20 F-16D Block 52+ have been delivered from 2003 under project Peace Carvin IV.The initial order is for 12 aircraft with 8 options. Eventually, as many as 40 to 60 aircraft may be procured in several batches. Pending news on Lockheed Martin's F-35 Lightning II's progress, it is speculated that more F-15SGs may be bought, with the upper limit, as disclosed by the RSAF, being 80 F-15SG aircraft in total. On 22 October 2007, Singapore's Ministry of Defence (MINDEF) exercised the option to purchase eight more F-15SG fighters as part of the original contract signed in 2005. Along with this buy, an additional order for four F-15SGs was made, bringing the total number of F-15SGs purchased to 24. The RSAF embarked on its Next Generation Fighter (NGF) programme to replace the ageing A-4SU Super Skyhawks. The original list of competitors was shortlisted to the final two – Dassault Rafale and the F-15SG Strike Eagle. The DSTA (Defense Science & Technology Agency) conducted detailed technical assessment, simulations and other tests to assess the final selection. On 6 September 2005, it was announced that the Boeing F-15SG Strike Eagle had won the contract over the Rafale. In January 2005, it was announced that 6 Sikorsky S-70B (derivative of SH-60 Seahawk) naval helicopters will be purchased, complete with anti-surface and anti-submarine weapons and sensors.. 2 more Seahawks were ordered in 2013. The Seahawks are operated by RSAF pilots, with System Specialists of the Republic of Singapore Navy operating the sensors and weaponry. They operate from the Navy's new Formidable class frigates, and when operating from land are based at Sembawang Air Base. All 20 AH-64D Longbow attack helicopters have been delivered, achieving pilot IOC. 12 of these Longbow Apaches were deployed back to Singapore and took part in combined arms exercises with the Army. In April 2007, it was announced that the 4 E-2C Hawkeyes were to be replaced with 4 Gulfstream G550s fitted with the IAI EL/W-2085 radar which would become the primary airborne early warning aircraft for the RSAF. Not included in the deal is an additional G550 as an AEW trainer, which will be acquired and maintained by ST Aerospace on behalf of RSAF. In July 2010, the Alenia Aermacchi M-346 Master was selected by the RSAF to replace the A-4SU Super Skyhawks in the Advanced Jet Training (AJT) role, currently based at BA 120 Cazaux Air Base in France. And in a press release by the Singaporean Ministry of Defence on 28 September 2008, ST Aerospace had been awarded the contract to acquire twelve M-346 and a ground based training system on behalf of RSAF. As stipulated in the contract, ST Aerospace will act as the main contractor to maintain the aircraft after delivery by Alenia Aermacchi while Boeing would supply the training system. Delivery date is scheduled from 2012 onwards. The backbone of the transport fleet are the four KC-130B, one KC-130H and five C-130H Hercules transport aircraft, which are expected to remain in service through 2030, will be undergoing an extensive modernisation process to bring all ten existing airframe to the same common standard. The first airframe, a KC-130B, was returned to frontline service on 21 September 2010. ST Aerospace, the main contractor behind the project, is expected to upgrade the other nine airframes for the RSAF within the next seven years. Included in the package is the replacement of cockpit flight management system with a modern glass cockpit avionics suite, central engine displays to replace analogue gauges, improved voice communications, digital autopilot, flight director as well as a digital weather radar, which will make the aircraft Global Air Traffic Management-compliant. Also, the C-130Bs will receive an auxiliary power unit and environmental control system in common with the C-130Hs. Once the upgrade is completed, this will effectively give the RSAF five refueller KC-130Hs and five Cargo C-130Hs. In December 2010, the RSAF issued a letter of request to inspect stored ex-US Navy P-3C Orion aircraft that have been retired from active duty. Lockheed Martin believes the RSAF has a requirement of 4 to 5 of these aircraft, which would be modernised extensively before reintroduction into active service. On 30 June 2018, Defence Minister Ng Eng Hen announced that the F-16's replacement will be announced soon meanwhile the KC-135R tankers are being replaced by the A330 MRTT while replacements for other fix-wing aircraft and helicopters are announced. On 18 January 2019, MINDEF officially confirmed the procurement of F-35 JSFs for a full evaluation of their capabilities and suitability before deciding on a full fleet to replace the aging F-16 fleet. RSAF F-15SG at Darwin International Airport, 2011. RSAF KC-135R at Avalon Airport, 2001. RSAF AS532UL Cougar at Avalon Airport, 2009. A retired 140 Sqn Hawker Hunter FGA.74S – serial number 527 (ex-RAF XF458), parked outside the RSAF Museum. Note also the number of hardpoints and the ADEN gun ports which had been faired over to protect this museum piece against the weather. (UK) Hawker Hunter — 12× FGA.74, 26× FR.74A/B, and 8× T.75/A (excluding one T.75A which was lost in accident before delivery) were delivered to RSAF in 1970 and 1973. Upgraded in the late 1970s by Lockheed Aircraft Services Singapore (LASS), the type was redesignated as FGA.74S, FR.74S and T.75S. Retired and phased out of service in 1992, only 4 were preserved as museum exhibits and gate guards while the remaining 21 airworthy airframes was sold to an Australian Warbird broker, Pacific Hunter Aviation Pty, in 1995. (US) General Dynamics F-16 Fighting Falcon — 4× F-16As and 4× F-16Bs delivered in 1988 under the Peace Carvin I program, one F-16A was lost following a mid-air collision with another F-16A over South China Sea in 1991. All surviving airframes were retired in 2002 and was subsequently upgraded locally to "Falcon One" standard by ST Aerospace before being transferred to Royal Thai Air Force in 2004. (UK) Short SC.7 Skyvan — 6× Skyvan 3Ms delivered in 1973 and retired in 1993. (UK) BAC Jet Provost — 5× T.52s (ex-South Yemen Air Force airframe) operated from the 1975 until 1980. (UK) BAC Strikemaster — total 25 received (16× Mk.84s delivered in 1969 from UK plus 4× Mk.81s from South Yemen in 1975 and another 5× Mk.82s from Oman in 1977), all were retired in 1984 with one airframe preserved at the RSAF Museum while the remaining 13 airworthy airframes were sold to a Warbird broker. (US) Cessna 172 — 8× F172Ks delivered in 1969, retired in 1972. (US) Lockheed T-33 Shooting Star — 20× T-33As (ex-French Air Force airframes), operated from 1980 until retired in 1985. (Italy) SIAI-Marchetti SF.260 — 14× SF.260Ms delivered in 1971 plus 12× SF.260Ws delivered in 1979 and 1981. All remaining 19 airworthy airframes retired in 2002 and transferred to the Indonesian Air Force. (Italy) SIAI-Marchetti S.211 — Since 1984, 32× S.211s were acquired for RSAF's Basic Jet Training (BJT) program (this figure includes 24 airframes which were assembled locally by Singapore Aircraft Industries plus two former Haitian aircraft acquired as attrition replacements in 1994). Phased out from June 2008, of the remaining 25 airworthy S.211s, 21 were sold off to International Air Parts (IAP) Group Australia Pty Ltd in 2009 while 4 were shipped back to Singapore, being preserved as museum exhibits. (France) Aérospatiale Alouette III — 8× SA316Bs delivered in 1969, retired and transferred to Royal Malaysian Air Force in 1978. (France) Eurocopter AS350 Ecureuil — 7× AS350Bs for basic helicopter training, all delivered between 1981/82 and retired in 1992. (France) Eurocopter AS550 Fennec — 6× AS550A2 + 14× AS550C2, all delivered in 1991 and was retired in December 2006. Subsequently, the six AS550A2 were sold off to Chadian Air Force in 2010. 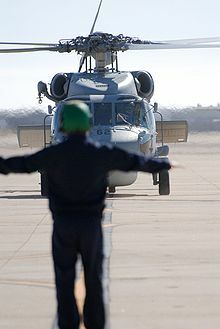 (US) Bell UH-1B — 20× UH-1Bs (refurbished ex-US Army airframes not including 10 spares) for advanced helicopter training, operated from 1980 until 1988. (US) Bell UH-1H — total 25 acquired, all are now retired except for 7 airframes which were refurbished and modernised before resale to the Philippine Air Force in a 2003 US$12 million deal. (US) Bell UH-1N Twin Huey — 3× UH-1Ns (military version of the Bell 212 Twin Huey) delivered in 1977, all retired in 1985 and sold to Sri Lanka Air Force. United States (500/1000/2000 pound) General Purpose Bombs ? United States Portable Search & Target Acquisition Radar ? (UK) Bloodhound (missile) Mk.II SAM – ex-RAF stock (total 88 missiles), all retired in 1994. Wikimedia Commons has media related to RSAF Black Knights. First formed in 1973 at Tengah Air Base, the Black Knights is RSAF's official aerobatic team and has been performing on an ad-hoc basis since its inception, with volunteer pilots drawn from various front line squadrons within the RSAF. The aerobatics team has performed on events including the recent Singapore Airshow 2014. Wikimedia Commons has media related to Republic of Singapore Air Force Museum. The RSAF maintains the Air Force Museum, which was first located at Changi Air Base before it was relocated to a purpose-built building currently situated along Airport Road adjacent to Paya Lebar Air Base. The museum is open to the public and showcases the air force's history and capabilities. Exhibits include the Northrop Grumman E-2 Hawkeye and numerous A-4SU Super Skyhawk. The Republic of Singapore Air Force has loaned several aircraft, and aircraft parts to the tertiary institutions in Singapore, including Institute of Technical Education, Ngee Ann Polytechnic, Singapore Polytechnic, Nanyang Polytechnic and Nanyang Technological University since 2005. Aircraft includes the A-4SU Super Skyhawk. ^ a b "History of RSAF: OUR EARLY DAYS". Wings on High: 35 Years of the Republic of Singapore Air Force. Ministry of Defence (Singapore) (MINDEF). 9 July 2010 . Archived from the original on 17 October 2013. Retrieved 3 June 2011. ^ a b Jefford 2001, pp. 48–49. ^ "Arrival of Cessna 172K – A Boost to our Fledgling Air Force". MINDEF. 7 May 2004. Archived from the original on 7 October 2007. Retrieved 25 September 2008. ^ "VIP send-off for Gen Bulsak". The Straits Times. Singapore Press Holdings. 23 January 1973. p. 5. Archived from the original on 7 November 2012. Retrieved 3 June 2011. ^ "Mr. Lee hosts Istana dinner". The Straits Times. Singapore Press Holdings. 11 February 1972. p. 12. Archived from the original on 7 November 2012. Retrieved 3 June 2011. ^ "RSAF50". www.mindef.gov.sg. Archived from the original on 1 April 2018. Retrieved 1 April 2018. ^ "RSAF to roll out biggest aerial display of the year over National Day weekend". Archived from the original on 12 August 2018. Retrieved 12 August 2018. ^ "Singapore Armed Forces Concludes Deployment in Afghanistan". Archived from the original on 3 March 2016. Retrieved 25 February 2016. ^ "Joint Statement Issued by Partners at the Counter-ISIL Coalition Ministerial Meeting". Office of Website Management, Bureau of Public Affairs. Office of the Spokesperson, Washington, DC. Archived from the original on 8 March 2016. Retrieved 25 February 2016. ^ hermesauto (9 October 2017). "75 SAF soldiers honoured for contributions in fight against ISIS". Archived from the original on 6 July 2018. Retrieved 6 July 2018. ^ "SAF Leadership". MINDEF. Archived from the original on 8 October 2015. Retrieved 21 October 2015. ^ "Singapore Government directory: Air Force HQ". Government of Singapore. Archived from the original on 8 December 2015. Retrieved 5 May 2015. ^ "Change in Chief of Air Force". Ministry of Defence, Singapore. 22 February 2019. Archived from the original on 2 April 2019. Retrieved 22 February 2019. ^ "Past Leadership". mindef.gov.sg. Ministry of Defence. Archived from the original on 21 March 2019. Retrieved 23 January 2019. ^ "THE 3RD GENERATION RSAF". www.mindef.gov.sg. Archived from the original on 17 October 2013. Retrieved 13 July 2013. ^ "Inauguration of the Unmanned Aerial Vehicle (UAV) Command" (Press release). MINDEF. 24 July 2009. Archived from the original on 5 August 2012. Retrieved 3 June 2011. ^ "RSAF Commands and Units – A Brief Overview ⋆ MAphotoSG". Archived from the original on 18 July 2018. Retrieved 18 July 2018. ^ "UAV Command (UC)". www.mindef.gov.sg. Archived from the original on 8 August 2017. Retrieved 8 August 2017. ^ "Air Defence & Operations Command (ADOC)". www.mindef.gov.sg. Archived from the original on 12 March 2014. Retrieved 29 June 2012. ^ "RSAF Inaugurates Participation Command" (Press release). MINDEF. 28 May 2008 [4 January 2008]. Archived from the original on 15 October 2017. Retrieved 3 June 2011. ^ "RSAF - Homepage". www.mindef.gov.sg. Archived from the original on 8 August 2017. Retrieved 8 August 2017. ^ "RSAF new "old" 142sqn flying F-15SG ⋆ MAphotoSG". Archived from the original on 15 April 2016. Retrieved 3 April 2016. ^ Nurw (16 July 2018). "DEFENSE STUDIES: RSAF Unveils 200 Squadron". Archived from the original on 10 July 2018. Retrieved 10 July 2018. ^ "SPEECH BY CHIEF OF AIR FORCE MG HOO CHER MOU AT THE CHIEF OF AIR FORCE CHANGE OF COMMAND PARADE ON 28 MARCH 2016" (PDF). Archived (PDF) from the original on 10 July 2018. Retrieved 10 July 2018. ^ "Cazaux Airshow / Spotters Day 2005 Review: "Situated South West of Bordeaux is station BA120 Cazaux"". Airshows.co.uk. 12 June 2005. Archived from the original on 23 June 2011. Retrieved 3 June 2011. ^ Adam Baddeley (February 2011). "The RSAF Inaugurates the M-346 into 150 Squadron". Asian Military Review. Archived from the original on 5 September 2014. Retrieved 11 July 2011. ^ "RSAF Celebrates 10 Years of Chinook Training in the US" (Press release). MINDEF. 20 June 2005 [23 April 2005]. Archived from the original on 26 October 2007. Retrieved 3 June 2011. ^ Patsy Robertson (29 May 2009). "Fact Sheets: 425 Fighter Squadron (AETC)". Air Force Historical Research Agency (AFHRA). United States Air Force (USAF). Archived from the original on 20 May 2011. Retrieved 3 June 2011. ^ Patsy Robertson (29 May 2009). "Fact Sheets: 428 Fighter Squadron (ACC)". AFHRA. USAF. Archived from the original on 20 May 2011. Retrieved 3 June 2011. ^ "Australia-Singapore Defence Relationship" (Press release). MINDEF. 26 June 2005 [17 October 1996]. Archived from the original on 8 April 2014. Retrieved 3 June 2011. ^ "Minister for Defence Visits the US" (Press release). MINDEF. 15 June 2005 [8 May 2004]. Archived from the original on 29 October 2007. Retrieved 3 June 2011. ^ "Assets: Fighter aircraft" (Press release). MINDEF. 24 April 2010. Archived from the original on 2 February 2014. Retrieved 3 June 2011. ^ Mike Yeo (March 2011). "Tigers over Lion City". Air Forces Monthly. No. 275. London: Key Publishing. pp. 86–91. ISSN 0955-7091. ^ "Brazil favours Grifo F radar for F-5BR upgrade: "The air force has test flown the Singapore air force's upgraded version of the F-5S/T, fitted with the Grifo F radar."". Flightglobal.com. London: Reed Business Information. 11 April 2000. Retrieved 3 June 2011. ^ a b "RSAF Black Knights 2008: History". MINDEF. 24 April 2010. Archived from the original on 30 August 2008. Retrieved 3 June 2011. ^ "Singapore Receives First AH-64D Apache Longbow Attack Helicopter" (Press release). MINDEF. 26 June 2006 [18 May 2002]. Archived from the original on 26 October 2007. Retrieved 3 June 2011. ^ "Singapore to Purchase 12 Additional Boeing AH-64D Apache Longbows" (Press release). Boeing. 23 August 2001. Archived from the original on 3 June 2013. Retrieved 3 June 2011. ^ Jane A. Morse (8 September 2005). "Asia-Pacific Opens Hearts, Wallets to U.S. Victims of Katrina". The Washington File. United States Department of State. Archived from the original on 14 February 2008. Retrieved 3 June 2011. ^ "Hurricane Katrina: International helicopters Response". Helicopter History Site. Archived from the original on 11 June 2011. Retrieved 3 June 2011. ^ "SAF KC-135 Deployment to Aid in the Reconstruction of Iraq" (Press release). MINDEF. 15 June 2005 [9 June 2004]. Archived from the original on 4 August 2012. Retrieved 3 June 2011. ^ "SAF Deploys LST and C-130 to Assist in Reconstruction of Iraq" (Press release). MINDEF. 4 July 2008 [27 October 2003]. Archived from the original on 5 August 2012. Retrieved 3 June 2011. ^ "Reply by Minister for Defence Dr Ng Eng Hen to Parliamentary Question on Relocation of Paya Lebar Air Base". www.mindef.gov.sg. Archived from the original on 21 September 2013. Retrieved 20 September 2013. ^ "RSAF to celebrate 50th birthday with new aerial displays, heartland exhibitions". Archived from the original on 18 August 2018. Retrieved 18 August 2018. ^ "At Trump-Kim summit, RSAF showed the world it was operationally ready: PM Lee". Archived from the original on 1 September 2018. Retrieved 1 September 2018. ^ "About us: Ranks". MINDEF. 2011. Archived from the original on 17 October 2013. Retrieved 3 June 2011. ^ "Singapore Signs Letter of Intent for Joint Strike Fighter Programme" (Press release). MINDEF. 17 March 2006 [22 February 2003]. Archived from the original on 14 October 2017. Retrieved 3 June 2011. ^ "Singapore Joins Joint Strike Fighter Programme" (Press release). MINDEF. 4 June 2010 [16 March 2004]. Archived from the original on 18 January 2017. Retrieved 3 June 2011. ^ "Singapore Seals Deal to Acquire Twelve F-15SG" (Press release). MINDEF. 18 April 2006 [12 December 2005]. Archived from the original on 25 March 2006. Retrieved 3 June 2011. ^ "Republic of Singapore Navy Acquires Six New Naval Helicopters" (Press release). MINDEF. 8 June 2005 [21 January 2005]. Archived from the original on 15 October 2017. Retrieved 3 June 2011. ^ "Trade Registers". armstrade.sipri.org. Archived from the original on 14 April 2010. Retrieved 26 October 2010. ^ "Factsheet: G550 – Airborne Early Warning" (Press release). MINDEF. 23 April 2007. Archived from the original on 15 October 2017. Retrieved 3 June 2011. ^ "Singapore to Replace Hawkeye With G550 AEW". Defense-Update.Com. 8 May 2007. Archived from the original on 5 September 2008. Retrieved 3 June 2011. ^ Craig Hoyle (16 September 2008). "Singapore to get additional G550 as AEW trainer". FlightGlobal.com. Archived from the original on 25 February 2012. Retrieved 28 June 2011. ^ "Alenia Aermacchi's M-346 wins Singapore jet trainer race". Jane's Information Group. 12 July 2010. Archived from the original on 19 July 2010. Retrieved 16 July 2010. ^ Govindasamy, Siva (8 July 2010). "Singapore to announce M-346 trainer selection". Flightglobal.com. London: Reed Business Information. Archived from the original on 11 July 2010. Retrieved 16 July 2010. ^ S., Ramesh (28 September 2010). "MINDEF awards contract to ST Aerospace to acquire 12 M-346 aircraft". Singapore: Channel NewsAsia. Archived from the original on 29 September 2010. Retrieved 28 September 2010. ^ "New Generation Advanced Fighter Trainer for the RSAF" (Press release). MINDEF. 28 September 2010. Archived from the original on 5 August 2012. Retrieved 3 June 2011. ^ "New fighter trainer for RSAF". The Straits Times. Singapore Press Holdings. 28 September 2010. Archived from the original on 1 October 2010. Retrieved 3 June 2011. ^ Gary Parsons (21 September 2010). "Singapore gets first upgraded C-130". Key Publishing. Archived from the original on 14 March 2012. Retrieved 28 June 2011. ^ Greg Waldron (12 November 2010). "Singapore's C-130 upgrade makes progress". FlightGlobal.com. Archived from the original on 15 November 2010. Retrieved 28 June 2011. ^ Craig Hoyle (15 December 2010). "Singapore interested in ex-US Navy P-3s". Flightglobal.com. Archived from the original on 1 May 2011. Retrieved 3 June 2011. ^ "SAF acquires new fighting machines to do more with less, will reveal replacement for F-16 fighter jets soon". Archived from the original on 10 July 2018. Retrieved 6 July 2018. ^ "Singapore identifies F-35 fighter jet to replace F-16s, expects to buy 'small number' for full testing". Channel NewsAsia. Archived from the original on 18 January 2019. Retrieved 18 January 2019. ^ "Singapore to buy 4 F-35 fighter jets with option for 8 more; price comparable to F-15SG". Channel NewsAsia. ^ a b c d e f g h i j k l m n o p q "World Air Forces 2019". Flightglobal Insight. 2019. Archived from the original on 23 January 2019. Retrieved 12 March 2019. ^ "World Air Forces 2018". Flightglobal Insight. 2018. Archived from the original on 6 February 2018. Retrieved 2 April 2018. ^ "Singapore joins ranks of A330 MRTT operators". flightglobal.com. Archived from the original on 26 March 2019. Retrieved 12 March 2019. ^ Peter, Atkins (November 1994). "Singapore or Bust". Air Forces Monthly. No. 67. London: Key Publishing. ISSN 0955-7091. ^ "Hunter for sale". Pacific Hunter Aviation. Archived from the original on 16 February 2011. Retrieved 15 April 2011. ^ a b c d e f g h i j k l m n o p q r s t u v w x y z aa ab ac ad ae af ag ah ai aj "SIPRI arms transfer database". Stockholm International Peace Research Institute. 19 March 2012. Archived from the original on 31 January 2011. Retrieved 20 March 2012. ^ "F-16: Republic of Singapore Air Force". www.f-16.net/. Archived from the original on 22 December 2008. Retrieved 30 December 2008. ^ "Aircraft registration - UK Civil Aviation Authority". www.caa.co.uk. Archived from the original on 6 June 2011. Retrieved 25 September 2008. ^ "HISTORY OF THE STRIKEMASTER". BACStrikemaster.co.uk. 2010. Archived from the original on 4 September 2011. Retrieved 3 June 2011. ^ Hendrik van der Veen (31 December 2007). "SF.260 in military service". www.siai-marchetti.nl. Archived from the original on 30 October 2006. Retrieved 3 June 2011. ^ Hendrik van der Veen (16 October 2010). "SIAI-MARCHETTI S.211 production list". siai-marchetti.nl. Archived from the original on 28 October 2006. Retrieved 3 June 2011. ^ "File Not Found". www.mindef.gov.sg. Archived from the original on 14 May 2018. Retrieved 14 May 2018. ^ a b c d ""Pointer", SAF Journal: 30 Years of Helicopter Operations". MINDEF. Archived from the original on 29 July 2013. Retrieved 27 September 2008. ^ Yeo, Mike (30 March 2018). "Singapore confirms delivery of Aster 30 missile with video post". ^ "RSAF Acquires Russian Made IGLA Air Defence Missile System" (Press release). MINDEF. 28 June 2005 [15 October 1997]. Archived from the original on 14 October 2017. Retrieved 3 June 2011. ^ "Factsheet: Mechanised Igla" (Press release). MINDEF. 23 April 2007. Archived from the original on 29 June 2007. Retrieved 3 June 2011. ^ Ong Hong Tat (17 June 2011). "No escape from the SPYDER". MINDEF. Archived from the original on 4 August 2012. Retrieved 17 June 2011. ^ a b "Lockheed Martin's long-standing relationship with Singapore" (Press release). Lockheed Martin. 2011. Archived from the original on 22 October 2007. Retrieved 3 June 2011. ^ "Assets > Weapon Systems > Giraffe". MINDEF. 24 April 2010. Archived from the original on 13 June 2014. Retrieved 29 June 2011. Andrade, John (1982). Militair 1982. London: Aviation Press Limited. ISBN 978-0-907898-01-6. Huxley, Tim (2000). Defending the Lion City: the Armed Forces of Singapore. Allen & Unwin Pty LTD. ISBN 978-1-86508-118-2. Wing Commander C. G. Jefford (2001). RAF Squadrons: A Comprehensive Record of the Movement and Equipment of All RAF Squadrons and Their Antecedents Since 1912. Shrewsbury, Shropshire, UK: Airlife Publishing, 1988. ISBN 978-1-84037-141-3. Peacock, Lindsay (1987). Osprey Combat aircraft Series No.11: A-4 Skyhawk. London: Osprey Publishing. ISBN 978-0-85045-817-6. Pocock, Chris (August 1986). "Singapore Sting". Air International. No. ???. London: Key Publishing. pp. 59–64, 90–92. ISSN 0306-5634. Wikimedia Commons has media related to Republic of Singapore Air Force. MINDEF, The NS Portal, accessed 23 October 2006. United States Department of State, Background notes on Singapore, accessed 23 October 2006. "Teamwork in action" – A late 1970s RSAF documentary on YouTube, accessed 24 May 2011. RSAF 40th Anniversary Video – First Generation on YouTube, accessed 24 January 2009. RSAF 40th Anniversary Video – Second Generation on YouTube, accessed 24 January 2009. RSAF 40th Anniversary Video – Third Generation on YouTube, accessed 24 January 2009. RSAF's newly delivered F-15SG arrives at Mountain Home AFB on YouTube, accessed 12 May 2009.